It seems that it is only occurring for people with windows. The other platforms seem to be running ok. We had some trouble getting the binaries for windows in order to release, I am thinking something went wrong there, as none of the windows runs are passing. I took down the Windows version for now until I figure it all out. If you are a Windows user please abort all N-body tasks and go into Preferences and uncheck "MilkyWay@Home N-Body Simulation" for now. Message 63599 - Posted: 15 May 2015, 23:29:09 UTC - in response to Message 63598. I wondered why after 7hrs (overnight) a task was 100% complete but not being processed. This was usually tying up 3 of 4 CPU cores :/ so other tasks weren't being started. I've now aborted the NBody tasks. If are a Windows user, please go into Preferences and uncheck "MilkyWay@Home N-Body Simulation" for now. Message 63604 - Posted: 16 May 2015, 9:54:52 UTC - in response to Message 63603. If it's a Windows Nbody task, it's broken. But then, it's normally broken. I apologize for the silence. I am looking into the problem. We had issues with getting the windows version ready for release, and I believe something went wrong in the process. I ran those binaries on windows and they seemed to have worked properly at the time. However, it seems that no windows runs are working. The other versions of the code are ok so far and I am getting results on my end. If you have nbody running and stalled abort it for now. I deprecated the windows version of the app but I believe some may still be sent out before it is completely down. This was an unexpected problem with the binaries as they worked on our end, and I apologize for the issues you are having and the frustration incurred. Please be patient, as we are working on the issues. Message 63609 - Posted: 16 May 2015, 20:50:44 UTC - in response to Message 63598. Message 63610 - Posted: 16 May 2015, 20:55:16 UTC - in response to Message 63609. I unchecked the N-Body check box but still got n-bodies? Don't know why. Message 63615 - Posted: 16 May 2015, 23:58:31 UTC - in response to Message 63613.
ok found my answer. Fixed it, now does it matter if it is DE-N-body or PS-N-body? Message 63617 - Posted: 18 May 2015, 10:51:17 UTC - in response to Message 63613. You need to ALSO uncheck the box for "If no work for selected applications is available, accept work from other applications?" Message 63619 - Posted: 19 May 2015, 15:14:42 UTC - in response to Message 63602. The author of Sherlock Holmes once wrote, "When all possibilities are impossible, what remains is possible." Statisticians concerned about software quality ponder and try to contain what they call "degrees of freedom." Grid computing offers degrees of freedom on steroids. There are different varieties and flavors of machines, operating systems, versions of same, different processors tuned to optimize different things, different versions of CMOS, stepping levels, and driver issues. How does one design and code software to defend against all of these possibilities, especially in a heuristic simulation mode? That seems to be a daunting challenge. In addition to the above, anti-virus software sometimes behaves like an electronic version of Lupus when it spots a task that looks like a resource hog. Ditto for high-priority load balancing software provided with high-performance motherboards. If these do not bring BOINC to its knees, automatic updates requiring automatic restart trash cache memory, RAM, and even corrupt general registers so apps cannot close during a warm restart. Please cut Sid some slack. Message 63620 - Posted: 19 May 2015, 22:44:44 UTC - in response to Message 63619. Quote from The Sign of Four. Message 63621 - Posted: 20 May 2015, 15:48:38 UTC - in response to Message 63620. Thanks for the correction. I couldn't find the original quote. I used one from the lamestream media. Big mistake! Message 63624 - Posted: 21 May 2015, 13:23:12 UTC - in response to Message 63608. I have been having this issue since Nbody version 1.48 and maybe earlier. That version was released in February, but I do not recall if it began at release date. Do new versions go out when client does update? Message 63636 - Posted: 26 May 2015, 17:53:35 UTC - in response to Message 63624. One OSX client- same issue. 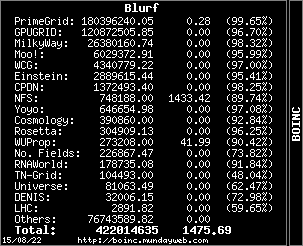 Hi - just thought I'd post here to say I had wondered about the Windows N-body tasks but just left them be, as I prefer leave BOINC to do its thing without being interrupted. If there was a Notice posted about aborting tasks I would have done so; you may wish to consider this to save others from using CPU time they don't need to. Thanks for your continued hard work to help us crunch your numbers! I am sorry that there has been so many bugs in the Nbody recently. The reason for it all comes down to the fact that we are developing a lot of new code for the app. We completely changed how we did the initialization to properly align with the science. That change led to a longer initialization time, which was inevitable. Next we changed how the dark and light matter were assigned. We are currently working on changing the sampling method used in the initialization which is another very drastic change, but should greatly speed up the initialization. As was said by Wisesooth, with so much development and for so many different platforms, we are bound to run into numerous unexpected problems. We cannot fully predict all of the issues beforehand. For example, it is plausible that one set of simulation parameters can lead to an extremely long run time, longer than predicted. These very specific parameters may not have been in our test cases, especially since each parameter goes to the 14th decimal place. In fact, if were able to test all of the possible parameters, we wouldn't need to use MW@H for optimization. Also, I think this may be one of the reasons some people are having such long simulation time. From the error reporting I have seen, much of the reported errors are in fact platform dependent. As for the broken windows binary during this release, this was very unfortunate. Though, I believe this was a binary issue and not due to the algorithm, I understand the level of frustration it caused. I hope to have the issue resolved before the next release so that we can release a windows version of the app. Although I may not have responded right away, I have read all of your posts and your feedback is vital to debugging our algorithm. I know there are many issues that still need to be worked on. We are working hard to fix them all. Please remain patient as we do so. NBODY is an amazing concept and app and we are working tirelessly to try and get it working the way it should.